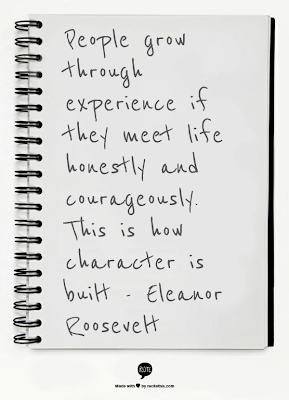 Lately, I've been obsessed with Eleanor Roosevelt and her quotes. She was one inspiring laday, Especially on the topic of courage! I've been thinking a lot about how I'm going to start taking action NOW! And how I can really make good use of my word of 2013: COURAGE! After thinking, about the things I want to do, and the fact, that I tend to talk more about doing, rather than actually doing it. Cause ya know talking is wayy easier than just doing something sometimes! I'd love to hear your thoughts on courage challenges, and how your overcoming your fears this year, or whether or not your going to try something that you've wanted with courage and enthusiasm? I am one of those people who is full of ideas but not very good at putting them into action. I really want to grow my business this year, so I am going to step out of my comfort zone and try some things I have never tried before. The hardest part is taking that first step. Telling people your goals and having them hold you accountable for reaching them is a great way to get started. I wish you much luck in taking that first step!